I don’t know about you, but I have several spots on the globe that are “dream vacations.” Egypt, Japan, and Greece come to mind. But one city that I would truly like to visit has a World Heritage Site in it (the Imam Mosque), and the city itself is like a museum of gorgeous architecture: Isfahan, Iran. The city has suffered neglect and decline over time, but a new generation of Isfahanis is making a concerted effort to restore historic buildings in this jewel of the Middle East (interesting article from the Smithsonian on the subject). My favorite building in Isfahan is the Mosque of Shaykh Lutfullah. Pay particular attention to the entrance porch, it’s absolutely gorgeous. After nine centuries of disunited and foreign (Turk and Mongol) rule, the Safavid dynasty united Iran under Shi’ism. The rule of Shah ’Abbas I (died 1629) marked the high point of the Safavid period. He moved the capital from the insecure western border (Qazvin) to Isfahan in central Iran in 1598. In order to shore up Safavid influence and prestige, ’Abbas planned a massive building program in Isfahan, building some of the most beautiful structures in Islam. His new city extended to the south of existing Isfahan. 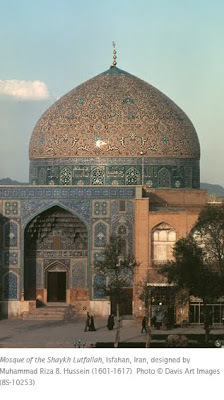 This mosque is unique among Safavid mosques in its design. It lacks all the characteristics of a mosque, such as an entrance courtyard, covered galleries, or minarets. It consists of a single octagonal, domed room surrounded by service areas. Typical of the Safavid buildings in Isfahan, it is covered in glorious ceramic tile mosaics. The muqarnas on the entrance porch are more pronounced than in the Friday Mosque in Isfahan, and covered with ceramic tile mosaics. Muqarnas are stalactite-like projections from a wall or dome in a tiered arrangement. The muqarnas are individual sections of molded plaster fitted together. The circular dome rests on the squinches (an architectural device that provides transition from a square building to support the base of a dome) formed by the eight walls forming the octagon. The building was named after a distinguished scholar and teacher, Shaykh Lutfallah Maysi al Amili, who went to Isfahan at ’Abbas’s request and took residence on the site. The building only took the shaykh’s name after his death in 1622/1623. It is sometimes thought to have been a royal chapel, though there is no record of that type of building existing in Safavid times. The original intent of the building is still unclear.